Little over two weeks ago, with much fanfare, T-Mobile announced that the iPhone 5 officially arrives in its smartphone portfolio. And, today, after a week of pre-orders, the Apple-branded handset finally goes on sale at the fourth-largest US mobile operator. T-Mobile is the last of the four major mobile networks in the US to get the iPhone 5, after AT&T, Verizon and Sprint. Also, the iPhone 5 is the first fruit-branded smartphone to officially reach the "un-carrier" -- as T-Mobile likes to call itself -- little short of six years after the first iteration came to market. This is a big moment for the mobile operator and Apple, but more so for T-Mobile which has announced that the iPhone 5, in both color choices -- white and black -- is available for the lowest upfront cost at any of the four major carriers in the US. Furthermore, unlike other major players, T-Mobile automatically lowers the total monthly fees after the smartphone is paid for, subtracting the cost of the installments. When purchased alongside the Simple Choice Plan, the 16 GB iPhone 5 runs prospective customers $99.99 upfront and $20 per month over the course of two years. For the 32 GB and 64 GB versions of the iPhone 5, customers have to shell out $100 and $200 more, respectively, upfront with the monthly fees remaining unchanged. T-Mobile also provides a trade-in offer, which eliminates the upfront cost for the iPhone 5 if customers hand over an iPhone 4 or iPhone 4S. They can also get up to $120 in credit, depending on the condition of the device that is traded-in. Prospective buyers can purchase the iPhone 5 outright at $579.99, $679.99 and $779.99 for the 16 GB, 32 GB and 64 GB versions, respectively. T-Mobile's pricing is $70 lower than Apple charges for the iPhone 5, off-contract, in each of the three storage trims. T-Mobile also offers the iPhone 4, in white and black, with 8 GB of internal storage for $18 upfront and 18 per month over the course of two years or $450 outright. 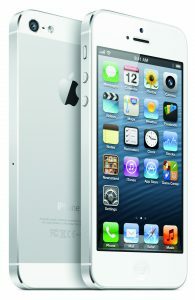 The iPhone 4S is available as well, in the same traditional color trims, with 16 GB of internal storage for $69 upfront and $20 per month for two years or $549.99 outright.